This game has a hidden sound test. Super Smash Bros. is a crossover fighting game combining characters from ten Nintendo franchises into a smash party filled with Hammers, tornadoes, explosions, Pokémon, Home-Run Bats, and an overenthusiastic announcer. The results were...well, the creativity and fun should speak for themselves. 801314B7 0004, 801314B7 0005 and 801314B7 0006 are unused camera positions. There's some very interesting things here, but not as many as Super Smash Bros. Melee's Master Debug Menu. Looks like Nintendo of America hates Star Wars. Two unused stages which are strikingly similar to Dream Land, using its music and background, that were likely used for testing. Contains three platforms whose ledges can be grabbed that float in a pyramid pattern above the main platform, that is not solid when interacted with from below. 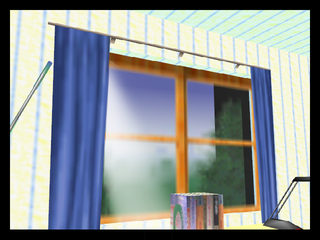 In the background stands a tree, two yellow cylindrical structures from the Kirby series, and patches of flowers; all three of these objects are otherwise unused. All textures except the upper, left and right parts of the floating wooden platforms and background are different than those used in Dream Land, and are also otherwise unused. Player 3 and 2 spawns in the left and right platform respectively and Player 4 and 1 spawns in the ground, below them respectively. The floating platform that appears after a KO may spawn at the ground, in the middle of the main platform, below the left platform, or below the right platform, slightly above the ground. Items never appear on this stage. Appropriately called "Small" in the battle debug menu. Features five wooden platforms, the smallest of which moves diagonally downward-left and upward-right, and two which move to the left and right above another platform; a textureless, irregularly-shaped platform; and an invisible platform above the stage. Only the main platform and the one above the middle of the stage are not solid when interacted with from below. It contains the same unused objects and textures as the stage above, and one of the patches of flowers moves to the left and right. Player 3 spawns in the floating platform in front of the tree, Player 1 spawns below it, Player 2 spawns at the right of Player 1, and Player 4 spawns between the moving wooden platforms. Like Test Stage 1, the floating platform that appears after a KO spawns at the ground, in the middle of the main platform. Called "New" in the battle debug menu. The bedroom seen in the intro and in the ending scene after completing 1P Game has a door that is always completely unseen. 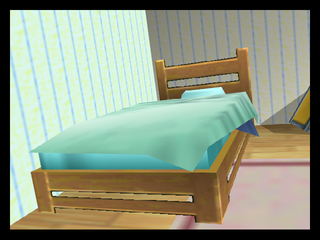 Since the camera focuses mostly on the table where Master Hand puts the dolls, the door stays hidden behind the camera. The pole holding up the window curtains is normally unseen as the camera never pans so high up. The bed is largely complete, but the left half remains out of view since the camera never moves far enough to show it. Instead of the usual characters, the GameShark shown below codes display skeletons, except Samus similar to those of the prerelease version (Kakuto-Geemu Ryuoh). 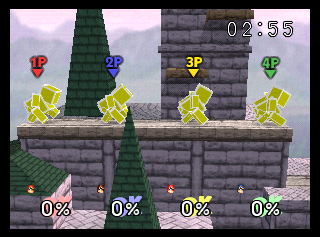 GameShark code will display physical hitboxes: the characters become yellow cubes, showing the areas they can be hit by attacks, and when attacks are used, red and white cubes appear showing the area they hit if in contact with someone's hitbox. Sprites such as shields and Ness' PSI Magnet will still appear. Those are shown in several images on the Japanese Super Smash Bros. website. Green Hurtbox Invincible (can get hit but takes no damage). Blue Hurtbox Intangible (can't get hit). 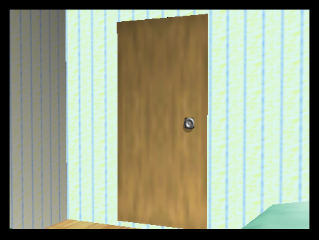 Regular items do not show hitboxes (including Link's Bomb), though projectiles used by Pokémon that emerge from the Poké Ball (including Beedrill) and those that emerge from the door in the Silph Co. building in Saffron City do, as well as the lasers from the Arwings in Sector Z. A huge amount of error strings and technical terms relating to the game's development exist in the data. Some of these can be seen below. gtl : DLBuffer over flow ! Player Num is Over for Camera! tem positions are over %d! Error : not %d targets! The following strings can be found relatively early on in each version's ROM. 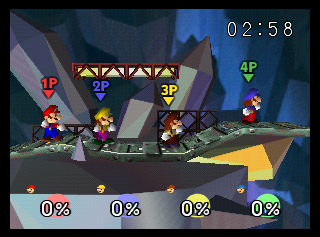 As shown here, "Final Destination" supports four players. Also, normally Player 1's damage meter appears where Player 2's should, and Master Hand's where Player 3's should, so the video also shows that it is possible for Player 1's damage meter appear where it normally should. Spawning locations for stages that are only accessible in 1P Game. These can only be accessed through the battle debug menu. 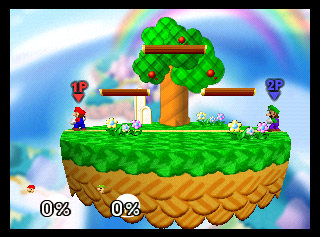 The stage where Metal Mario is fought contains unused spawn locations for Player 1, Player 2, Player 3, and Player 4, suggesting that it may have originally been playable in VS Mode. 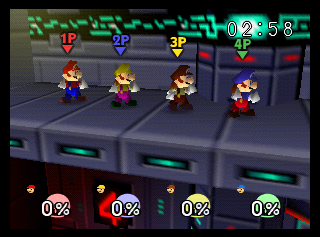 In 1P Game, Metal Mario spawns in the middle of the upper platform, and the player spawns in the ground, below him. 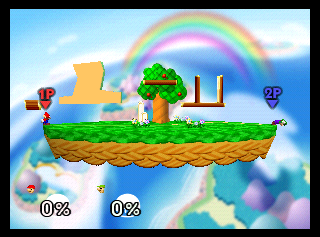 The stage used in the Race to the Finish bonus contains unused spawn locations for Player 2, Player 3, and Player 4. 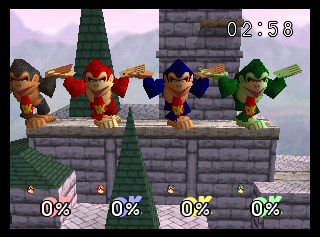 Using the battle debug menu reveals that Giant Donkey Kong has four unused alternate costumes that are identical to Donkey Kong's. Since Giant Donkey Kong is a separate character from Donkey Kong, it is a little unusual to see this, though they are likely just a result of the developers copying his data. All Fighting Polygon Team members, Giant Donkey Kong and Metal Mario can enter the Warp Pipe in Mushroom Kingdom, but they can't normally do that since they never appear in this stage. Hence, they have unused animations for entering it, and exiting horizontally and vertically that are identical to those of the respective characters they are a "clone" of. Each character has a death animation that is functional but completely unused. It could have been originally used for players getting eaten by Piranha Plants in Mushroom Kingdom or perhaps for at one point sinking into Planet Zebes' lava, but it's still unknown what it was supposed to be used for at this time. There are more unused sounds in the system debug menu. Find and add them. Check whether the sounds in this page are unused. A short fanfare. 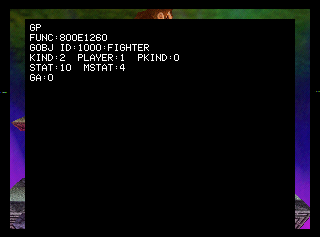 It can be played in the system debug menu as BGM no. 11. According to the game's director, Masahiro Sakurai, Final Smashes were intended to have been included since this game, but this idea never ended up happening. Final Smashes were later introduced in Super Smash Bros. Brawl. 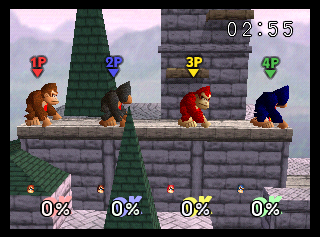 Sounds are the only remaining leftovers, and a few of them are used unaltered in Brawl, albeit with audio filters applied in real-time. All of these can be played in the system debug menu, although certain clips are exclusive to the Japanese version. 392 Kirby making a grunt and yelling, separated in two sounds. This would later return in the forth installment of Super Smash Bros. for 3DS and Wii U for his Final Smash, Ultra Sword, which originated in Kirby's Return to Dream Land. 366 "Ike! ", a Japanese term usually translated as either "come on" or "let's go." 546 "Pika..." and hoarsely "chuuuuu!" separated in two sounds. This would later return in Brawl for its Final Smash, Volt Tackle, though these sound clips probably weren't intended for that particular move; while Volt Tackle originated in the game Pulseman, it didn't appear in Pokémon until Pokémon Ruby and Sapphire, released nearly four years after Super Smash Bros..
343 "Come on!" It was re-recorded for Melee but kept as an unused sound, then used in Brawl as a part of his Final Smash and a taunt. 332 Only present in the Japanese version, "Blue Falcon!" It was re-recorded for Melee, who also kept this as an unused sound, and finally used in Brawl as a part of his Final Smash. It may also have been intended for his animation of entering the stage, when he exits the Blue Falcon. This remained undiscovered for 17 years. 455 "PK" and "Starstorm!" separated in two sounds. This concept and sounds would later return in Brawl as his Final Smash. Some sounds that would have added a little diversity to the game, but are unfortunately unused. 437 Mario's trademark "let's-a go!" Would have possibly been used in an after-match victory animation. The sound is recycled from Super Mario 64. 333 Donkey Kong making a grunt very similar to his KO sound effect. Present in the Sound Test as Voice no. 18. 400 Link exhaling his breath in a similar manner to his shouts when attacking. Unlike most of his sounds, this one is not from The Legend of Zelda: Ocarina of Time. A metallic friction sound of ambiguous description. This sound still exists in Melee. 600 "Yoshi!" Would eventually return in the other games of the series. 367 Fox shouting a strange grunt that is notably much lower-pitched than his other sounds. Present in the Sound Test as Voice no. 72. 428 A higher-pitched duplicate of Mario shouting "here we go!" Present in the Sound Test as Voice no. 104. 425 "Let's-a go!" 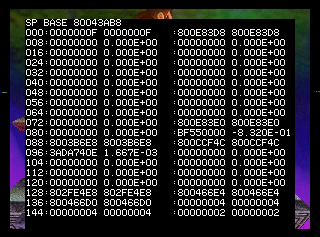 Also a higher-pitched duplicate leftover of Mario's unused audio documented above. It returned, slightly altered, in Melee in one of his after-match victory animations. 342 Captain Falcon yelling and making grunts, as usual. FGM no. 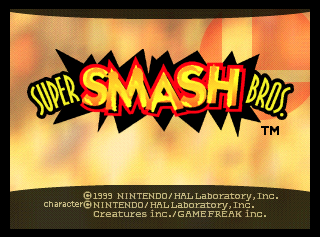 339 was re-recorded for Melee. Present in the Sound Test as Voice no. 107 and 110 respectively. 446 Ness grunting loudly. Present in the Sound Test as Voice no. 127. 568 Two sounds of Jigglypuff crying "Jiggly!" and one of it making a grunt. They returned in Melee, and in Brawl except for FGM no. 566. Present in the Sound Test as Voice no. 145, 146 and 147. Despite being unused, they have Japanese counterparts... that are also unused. Not only do playable characters have unused voices, but the announcer does too. 198 May have been used before each bonus stage was given a specific name. Regardless, its existence in the game at all implies that there was either only one type of Bonus Stage or a lack of specific voice clips. Present in the Sound Test as Voice no. 198. 509 This clip was likely also planned for the bonus stages, and would've replaced the typical "3, 2, 1" countdown in its stead. The bonus stages don't have any sort of pre-emptor in the final game, and the announcer just shouts "go!" to signify when a player can start. In Melee, Brawl, and Smash 4, he says "ready?" to precede these occasions. 525 The announcer doesn't say anything before the battle with Master Hand, and never announces what stage the player currently is in 1P Game. 484 May have been an early name for Sudden Death, or such a thing might not have existed. 451 Present in the Japanese version, where it is always referred to its name in that region, Purin. It sounds very similar to the announcement used in international versions, only slightly higher-pitched, and it shows the developers were fully aware of the possibility of the game being localized. A few random sound effects are also rendered unused throughout the whole game. 16 A lower-pitched duplicate of the sound heard when a shield breaks. 161 Similar to the music that plays in the continue screen, but shorter, quieter, and repeats twice. 515 - 524 This is repeated nine times in the list with subtle differences. 669 A rather weird sound which has an immense similarity to the sound used in Yoshi's Egg Lay but with a reverb, played at a much lower pitch and with some effects applied to it. 670 A similar case to the sound above but in reverse. 671 A sound very similar to the one heard when a player touches a Poison Mushroom in Melee. 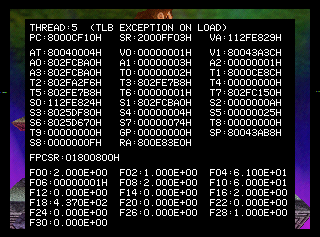 The crash debugger consists of three pages, press Z + R + L to scroll through them. The first page displays the type of crash and the registers, the second page displays a stack trace and the third page displays different contents depending on the type of crash. The same crash debugger can also be found in Kirby 64: The Crystal Shards and Pokémon Snap, both of which were also developed by HAL. There are two hitboxes for Samus and Luigi that never spawn in-game due to developer oversights involving frame timers. Luigi's dash attack has a final hit that is intended to spawn on his head, but never does due to the wrong type of frame timer being used. Samus's up air also has a final hit that does slightly more damage and hitstun, but doesn't spawn due to a complete lack of a frame timer altogether. This page was last modified on 27 March 2019, at 06:04.